When will people understand the purpose of hashtags? I was quietly hoping someone would add ‘learn how to use hashtags’ to their list of New Year’s resolutions. But no. It’s February and it still looks the same. Probably because they don’t realize the issue in the first place. 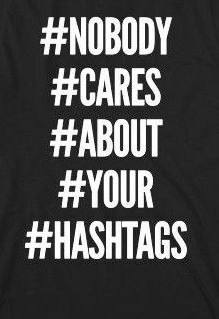 Fair enough, it’s not a worldly problem, but it hurts my eyes every time I go through a social media feed and I see those separated #hashtags. Please! First of all, hashtags are there for a reason. Whenever you post a text or photo to any form of social media, take a second to think about what you want others to see or read. Does this add value to someone who doesn’t know me? Sometimes, for example, when you post pictures on Instagram that you know deep down will only be appreciated by family members or close friends, like a blurry picture of your friends having dinner, you know, pictures that no one cares about except those close to you, in those cases there is no need for hashtags! Why? Because, hashtags are there to let other people find your post/picture. In other words: Unless you think random people would like to see a close up of your mosquito bite, don’t hashtag. Because why would you want anyone to see that? Second of all, do not separate the tags. For God’s sake. Why would you do that?! The one and only reason you use #hashtags is because you want others to find your post, because you think they might like it or find it useful for one reason or another, for people to click on the hashtag and find similar stories/pictures, or simply search for a topic. I.e when you post a photo of your cup of coffee or a view from your morning walk in the forest, you want people out there searching for a particular photo to find yours, by searching whatever actually relates to your post, so when you hashtag this way; #walk #in #the #forest or #cup #of #coffee, what do you think will happen?! Do you think someone will search for #the or #of and oh oh voilà – there’s your picture from the forest? Ehm. No. The hashtags should relate to the picture, even if the hashtag becomes super long (although 3-4 words are enough) So, #walk #in #the #forest would therefore become #walkintheforest. If you want to be more clear, simply use capitals – #WalkInTheForest. Upper cases will not make a difference when searching for a topic. Just don’t separate the words, no one ever searches for #this or #when etc. Sometimes though, people add hashtags that no one will search for, but the intention is simply to add some humor or sarcasm, for example: I love scary movies #WillNotSleepTonight. Same goes for Twitter and Facebook posts, you only hashtag the essential part letting people find the topic by adding hashtags like #BeyoncePregnant and not #beyonce #is #pregnant. Yeah OK you get it. Is it clear enough? Hope so! Yeah I know, but I honestly don’t know if people separate them on purpose or if they just don’t know…?